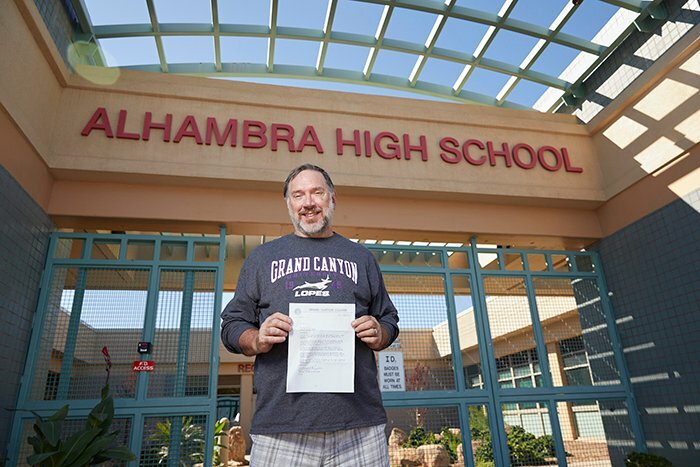 Alhambra grad Brian Smith was accepted to Grand Canyon College 43 years before attending. When Brian Smith, 60, walks across the stage Friday afternoon for the final steps of his online master’s degree in Nursing, in his coat pocket will be a copy of a 43-year-old typewritten note from Grand Canyon College. A 17-year-old Smith received the letter in 1975 when his family lived in Phoenix. He was a junior at Alhambra High School when he applied to Grand Canyon. But he never got a chance to attend. Smith keeps a scrapbook called “The Story of My Life” at his home in Ohio. He had kept the letter in the book, laminated and out of sight for years before he decided to go back to school for his master’s degree. It stayed hidden even after he decided to get his master’s. He was all set to attend a different university for the degree. But about a month before starting, he received a call from what now is Grand Canyon University. Smith said he then immediately received a call from University counselor Candace Dickens. 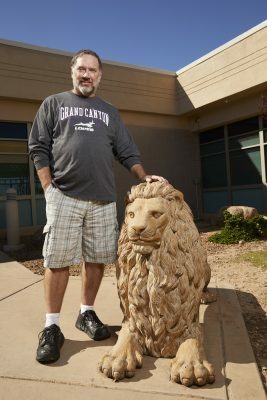 Brian Smith stands next to a lion statue at Alhambra High School. Smith said that because of his age, he wanted to complete the program in less than two years. So he doubled up his workload and finished in 14 months. Smith is a nursing instructor at Marion Technical College in Ohio. He taught at a different college before Marion and was a nurse at a major health care system for 17 years before he got into teaching. The Phoenix house he used to live in is no more. An apartment complex now stands at his previous address. But Smith was able to visit his old high school, where he reminisced about the Lion mascot at Alhambra that has become a part of his life. Smith has been thoroughly enjoying his trip back to Phoenix. His wife, Patti, is celebrating graduation with him. Awesome story! one of my best friends graduated from that high school! I graduated from Carl Hayden High School which is part of the Isaac school district just like Alhambra. GCU has a great relationship with those high schools. I am very proud of my brother Brian! I too was set to attend Grand Canyon College in 1977. I moved to Phoenix with my mom and brother and enrolled at GCC. I still have my student ID! But, when mom said that she and my brother were ready to move back to Ohio and leave me on my own, I chickened out and came back with them. Oh, how I have regretted that decision, some days.